Have you been disappointed about click-through rates for your emails? I had written my blog post and carefully crafted an email. I hit publish with a sigh of relief. Done. But when I looked at my email stats the next day, the results were disappointing. The opens were fine. So my subject line had been good. But the clickthroughs? Rather depressing. I had forgotten to open up the curiosity gap in my email. Sure, avid readers still clicked to read, but others? I had not given them a strong enough incentive to click through. Want to learn how to avoid this silly mistake? Want to get more people to open and read your emails? Being a new dad almost broke him — until one moment changed everything. A rover dived to the bottom of the ocean. 15 photos show what it found there. A homeless man was tried for stealing $4.50 worth of food. Here’s what the judges said. The biggest circus lion rescue of its kind just happened, and it was epic. These titles make us click by opening up a curiosity gap. First they share a piece of information, then they highlight something we don’t know yet so we itch to click and find out more. The gap in knowledge makes us impatient to learn more. In his book Curious: The Desire to Know and Why Your Future Depends on It, Ian Leslie calls this diversive curiosity: “the restless desire for the new and the next.” This type of curiosity is quite superficial as the search for information is aimless and impulsive. Leslie calls it epistemic curiosity: “a quest for knowledge and understanding.” This type of curiosity requires more effort, a deeper dive into a topic. Instead of making us impatient, it nourishes our soul. The first part of the headline refers to a desire many writers have: making the copywriting process pain-free. The second part of the subject line creates curiosity: Which are those 5 key questions you must answer? Subject line: Do You Know This #1 Fiction Writing Trick For Compelling Business Content? The email aims to increase desire to read more by referring to three benefits: a trick for writing compelling content, making your content more credible, and adding pizzazz to any business content. Also, the email arouses more curiosity: the email suggests the writing trick is not storytelling (what could it be then? ); the email poses the question whether you want to know what this #1 trick is; and it refers to one of my favorite fiction books (which could that be?). Want to know how to repair a puncture? How to create a formula in Excel? How to create an image using Canva? We google a question and instantly find an answer. Are we losing our ability to dive deep into a topic? A few years ago, I had temporarily lost the ability to read a difficult book. It’s embarrassing to admit it. But I was tired. I was restless. And overwhelmed. By managing distractions and my energy level, I slowly regained the ability to concentrate. To read rather than skim books. My curiosity was rekindled, and life became more fascinating, more colorful again. Instant answers are useful to help readers get unstuck. But it’s the deepening of knowledge and sharing of our skills where the magic happens. I like to think each of your blog posts can cause a teeny-tiny ripple. A tip that makes life a bit better. A dash of inspiration. A feeling of connection. Let’s tickle curiosity to share knowledge with our readers. [A] society that believes in progress, innovation and creativity will cultivate [curiosity], recognising that the enquiring minds of its people constitute its most valuable asset. This post was the nourishing sort of click bait! I also like working in a zone where magic happens and people gain real skills that help them nurture themselves. I have been struggling with the emails I send out, trying to get the right balance between writing a whole blog post in them, and giving enough information so that people know what they will learn and how it will benefit them. It seems as though good headlines *must* have two parts: one which tells the reader what the email is about, and the second one which arouses their curiosity. Is this example that you have given the similar ‘formula’ for emails? i.e. curiosity, benefits, examples. This example you have included is one of your best recent emails, in my opinion (And I guess that is why you chose it today!) : it increases my curiosity by saying ‘it’s not storytelling’, then it tells me what I can do with what I learn, and finally also tells me what sort of examples to expect: sales copy, business writing and fiction. A good headline must provide a specific benefit explaining why people would read the post plus it much arouse curiosity. You don’t have to do this in separate parts; you can mix the two in one headline. And you’re right, the example email I included has seen one of the highest click rates this year. If possible, I try to increase curiosity and stress the benefits in my email. Sometimes it’s easier to arouse more curiosity than other times. I try not to make my emails to formulaic. While the ingredients are more or less the same, they don’t follow exactly the same pattern. In my experience, relying too much on the same pattern might make readers bored and might reduce click rates. I don’t have hard facts to prove this. It’s more a gut feeling based on what I’ve seen. Thanks for such a comprehensive response, and for the extra information on that link. I am going to analyse my own click throughs based on how much / little I put in the email, and see if there is a correlation. Thanks for such an useful post. Click rates are a nightmare to me too. Thanks for gathering all these insights on the topic. You’re welcome, Virginia. Thank you for stopping by! I love how you clarify the difference between curiosity that involves growth and service to others, versus click-bait. Thanks for constantly being a leader in emphasizing marketing with integrity, and how to go about it. The difference between the two types of curiosity only became clear to me after reading Ian Leslie’s book. Interestingly, in his book he mentioned “empathic curiosity” as another type of curiosity but I had written about that already last week (before I read his book). Thank you for your lovely comment, Kathy. Great insights. Curious- what are your favorite fiction books? A beautiful book. I went back and clicked through to the Fiction tip and saw your statements. Brilliant!!! I love this book and have recommended it widely. Not surprisingly, you have understood and clarified some of the technique that makes this book so special. Thank you for all of your work. As an engineer, I am not practiced in writing techniques. Your beautiful and simple explanations elegantly teach me techniques and concepts. Thank you. It takes more work to simplify, and I appreciate your art as well as your skill. This is quite an interesting concept and by the looks of it, very effective. I am bookmarking this page to come back and try to implement your strategy! Thanks for sharing. I get a lot of blog-promoting emails that use the headline as the subject line and then have an excerpt of the post. And I think that habit creates this pressure to be clickbait-y because you’re asking copy to do too many things. A reason I find your writing so persuasive is that I can tell each element is focused on getting me to take the next step. I think this approach is very liberating, because you don’t feel like you only have 5-10 words to create the curiosity gap. So looking at your email subject, email copy and blog headline – they all work together to entice and get me to read on without making the experience feel superficial. Thank you so much for your lovely comment, Anna. I appreciate it. You’re right. I try to entice people to read on with every piece of content I create. Even on a level of sentences this works: the purpose of each sentence is to read the next sentence. I sometimes repeat the opening paragraph in the email. Sometimes it works. Sometimes it doesn’t feel right. Really nice trick to get more open rates. I personally don’t like the buzzfeed type click bait headlines. They feel a way cheap and if you can’t meet the curiosity level yo might get a roof-shattering bounce rate. The other type, you talked about here, makes perfect sense and I believe will work. I am getting very low response to my emails and I think I should try this strategy. I agree with you. Those clickbait headlines feel cheap. I think that’s because we associate them with chasing clicks and sharing newsy titbits without furthering knowledge. They’re also written for scanners rather than readers. I hope you’ll enjoy trying out this strategy! This has been such a helpful post! I don’t know how many times I’ve not even opened an email that promises shallow content. Yet, I could not put my finger on HOW not to be like them. Thanks so much for delineating it so clearly! And I know why your avid readers click right through: We know your content is dependably rich with valuable lessons aimed at making us shine. Every Tuesday I come to the Internet with one first aim, and it’s to see what you’ve posted, and not so much how to titled it. (Although, from now on, I’ll pay more attention, haha. What a lovely comment, Katharine. Thank you so much! I couldn’t figure out why exactly those clickbait titles were irritating either. Until I read Ian Leslie’s book…. who knew that there’s more kinds of curiosity? …and the curiosity gap is opened by suggesting that the insight is useful available easily. Yep, that’s a good point! Insights rather than information. I enjoyed reading your post. Your email roused my curiosity and gave me something meaningful to think about. 😉 What makes this post stand out is its practical application. Thanks for sharing your insights and advice. Like you, I strive to write blog posts that go beyond instant gratification to deeper understanding of a topic. This can be a challenge in a world that thrives on the superficial. Reminds me of Brian Clark’s formula for writing irresistible content: meaning + fascination. The significance here is creating meaningful content. Then the writer uses curiosity (fascination) to motivate people to read further. One trend I’m sure you’re aware of is the fact that longer blog posts are shared and linked to more than shorter ones. Whether these longer posts actually get read is another matter. Perhaps this trend toward more in-depth posts is a reaction to the superficiality so common on the Internet. I don’t really like the trend for longer blog posts, because most people write them for Google rather than for their readers. Often the posts are wordy and stuffed with information that’s not exactly relevant. The content loses focus, and feel sometimes more superficial than shorter posts. Of course, this is a generalization – it’s not always like that! I’ve stuck with writing posts around 1k words, and it seems to be serving me well. My search engine traffic is growing nicely, despite not spending much time on SEO at all (I don’t do any linkbuilding). Interestingly, the post currently receiving most organic search engine traffic is also one of my shortest at just over 750 words. I was on a training a few years ago and trainer taught to sell the sizzle and not the steak. This goes right along with what your saying here. Getting that deeper knowledge is what we all want and just giving our readers hints and teasers will spruce up their curiosity even more. We are suppose to provide solutions but we want our readers to actually click on our articles to get those solutions. This becomes a win/win since we can write on topics more on what they’re most interested in and they get the answers they want. Thanks for the share . Have a good one! Yep, so true. If we don’t get readers to click, then we don’t get a chance to share our insights! In the end, it always comes back to understanding what your reader wants to learn, doesn’t it? > I think closing ourselves to the many online distractions may prove to be one of the biggest challenges we face. Yes, I agree. The internet can destroy our curiosity for deepening our knowledge because it keeps serving us instant answers. We must resist, and nurture our ability to focus. Another one of your golden posts, Henneke. I loved how simple but powerful your message and formula for creating curiosity is – desire + knowledge – and it makes so much sense in writing headlines. Thank you, Henneke. This post is very rich and insightful. I admire you for continually giving rich content at negligible cost to your readers. God bless you. Thank you, Ini. I appreciate your comment. I’m glad to read some tips on creating compelling subject lines. Marketing gurus often share their email templates, but without an enticing subject line we’re only getting half of the advice. Frankly, I think the subject line is even more important than the content, as long as you a providing something of value. Yep, I agree with you. Without a good subject line an email might not even get read. Interesting. I never really thought about curiosity much. Let me see if I got this right? First, there is no curiosity. The reader is satisfied and doesn’t click through or read on. Second, there is empathetic curiosity. The reader feels acknowledged and wants to know more. Third, there is trivia curiosity. The reader wants to know what happened, but in the end it doesn’t really matter. Fourth, there is deepening curiosity. The reader whats to know how something works, finds out, and has a sense of fulfillment. Great article. Love you in-depth research. Empathetic curiosity is interest in learning about other people’s feelings. So, I’d say for readers that would be applicable if the reader is interested in understanding the author’s feelings, for instance because she shares her experience about dealing with fear or self-doubt. As bloggers, we probably don’t really deal with readers who have no curiosity at all. Readers pre-select themselves by joining a list – they want to learn more about a topic. So we don’t necessarily start from a situation of no curiosity at all. We tease people a little to click through but we’re already connecting with a curiosity they have already. If you’re interested in this topic, then I highly recommend Leslie’s book. Noted everything down. Thanks for the post. The following is no criticism. If I had to make only one click and were to choose between “A rover dived to the bottom of the ocean. 15 photos show what it found there” (example from this post) and “I prefer the Crazy Workload? This One Simple Question Calmed Me Down and Eased My Stress” (one of your posts’ title), the second layout instantly wins over the first one. Reading the second title, I feel the gap in knowledge. Reading the first one, I feel nothing but irritation and the urge to get away ASAP. Maybe it is a simple matter of taste. I’m an ocean lover. But I have an impression to be forced into reading the news that a) have nothing to do with me; b) more repulsive: are trying to appear sensational, while they are not. Nevertheless, if the title was changed to “Ever dived to the bottom of the ocean? Have a look”, I would click without hesitation. And the e-mail title “Do You Know This #1 Fiction Writing Trick For Compelling Business Content?”, as well as the e-mail itself, have everything I love. They sound personal, engaging. I’m not surprised you’d rather click “Crazy Workload? This One Simple Question Calmed Me Down and Eased My Stress.” The Upworthy headlines have become more and more associated with cheap content. We don’t expect an in-depth article when you click through anymore. It appeals to the distracting type of curiosity and we’ve learned that those articles leave us feeling unfulfilled and unsatisfied. We don’t really learn something. The “Crazy Workoad? This One Simple Question Calmed Me Down and Eased My Stress” is one of my favorite headline formulas! I’m a very new blogger. I find the second type of curiosity inspiring me a lot. I’ll apply it for my next post. Am I the only one that wonders what the judges said to the homeless guy? I certainly have a long way to go. Thanks for pointing me in the right direction. Nope, you’re not the only one. I wanted to find out, too. Out of the 5 Upworthy headlines, that was the one that appealed most to me. This is noting but pure gold. And would fearlessly point out here that this idea deserves to be sold . Powerful headlines are great for pulling readers in to our party of words…! To win the game and stand.out, We must entice and mesmerize our readers to click and subscribe to what we have to say. We must find a way to enchant them so they’ll stay glude to our sentences. devouring every link like hungry lions geeding on preys. Open loops in email teasers. Because the truth is human brain is naturally designed to seek closure. We all desire to see behind the wall. To stay to the end of the story. To see if anything appeals to our interest. Yes, it’s natural and we can’t possibly fight it. Loops will create that urgent atmosphere for action in our readers. I’ll share this post right away. Thank you so much for stopping by, adding your thoughts and sharing the post. I appreciate it. I’m glad you enjoyed this one. This post is pure gold. I learned a thing or two about writing headlines years ago when blogging was still young. Those click-bait type ones worked OK back then. They don’t any more anyway. It’s a particularly important topic when your avatar is highly selective in what he clicks, but will commit to reading everything once the topic is relevant. I do believe this is the answer that’s been eluding me. Thanks again, Henneke. The discussion touches on a larger issue about all marketing tactics–even the ones relying on lizard-brain responses. I remember reading Cialdini’s “Influence,” and quickly becoming less susceptible to marketing messages and tactics after becoming more aware. “Conventional blogging wisdom” has an ever-shorter life-cycle. Nowadays when a marketer targets me with a headline about what keeps me awake at night, I’m more likely NOT to click out of sheer backlash to the overuse of this approach. After a while, you can sense there are no easy solutions to complex problems to be found in any e-mail anyway. A growing number of people thus probably prefer to proactively seek out solutions to larger issues in an outbound fashion. For stuff in my in-box, the ultra specific headlines that help me to hone one avenue of my craft gets the nod each time. 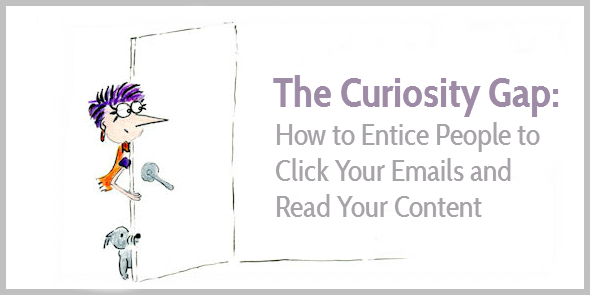 It does seem that the curiosity factor helps a lot with getting emails to be clicked. I find that most of the email ists i am now subscribed to are adding a mystery factor so you click through. Explaining the way you have has certainly helped me understand what to write in my own emails. I have the most difficult time reading books now. I guess it has a lot to do with blogging, but it takes me a long time to finish one. And the reasons I struggle are just you explained. Just wanted to share that point because I’m amazed that you have that too. Anyhow, curiosity gaps are really key. I recently realized that the emails I sent all had generic, boring subject lines. The same things that many other people used and didn’t entice any curiosity from my subscribers. Recently, I changed it up and have a drastic increase in opens and clicks. So I’m a huge believer in curiosity gaps now. Also, I always loved the subject line “Do You Know This #1 Fiction Writing Trick For Compelling Business Content?” Really hooked me in and had me begging to find out what this trick was. To get back into reading books, I started with reading more fiction. In the evening, I would switch off my computer earlier and read ah hour before going to bed. Also, I often take a break in the afternoon to read. Once I got back into reading fiction, I started picking up fiction books again. Great to hear you improved your opens and clicks so much, Andrew! Yes Henneke, I got the curiosity to learn more and write frequently. Thanks for your article Henneke, We love you. Many gems unfolded in this piece of content. Truly recommendable article. By using this curiosity gap, I hope to have growth in Open rate and CRT. Thanks for sharing this content. As a fiction writer, how could you do this to me? WHAT IS THE #1 FICTION WRITER TRICK????????? I’m at the ending of my book and having an awful time, painful time, I’m suffering. ……. I’m so sorry to read you’re having a painful time finishing your book. Writing a book can be so tough!